HURFOM: With the backing of local residents, Buddhist Monk Baddanda Oak Ta Ra has appealed for donations to support the construction of a Mon National School in Pal Do village, Mudon Township, Mon State. At present, no such school exists in the village, and students seeking to pursue the Mon National School program in Pal Do are attending classes operating out of the local monastery, and the local community center. Currently, the government-run Basic Education School in Pal Do only provides five years of Primary education (Kindergarten to Standard 4), whereas students who attend the Mon National School can study up to Standard 7. Apart from offering more classes, the curriculum is delivered in Mon, thus increasing the likelihood of academic success for students who may struggle with Burmese-language instruction. “We seek to establish a Mon National School and offer a Mon summer program. We have tried to do this for several years but have made little progress because we face financial difficulties. 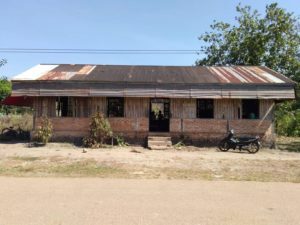 Last year, I traveled to Thailand and received nearly 800,000 baht (US $25,201) in donations to build the school, but it was not enough. 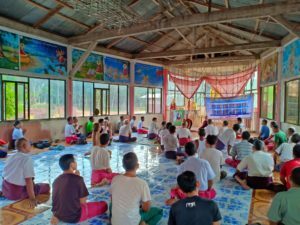 We’ve started building the school with that money, but we have to ask for more donations to finish the construction of school buildings,” said monk Baddanda Oak Ta Ra. There are approximately 80 students currently studying in the Mon National School program in Pal Do, with the number of students increasing every year. As well, the Mon National School summer program attracts some 300 students, but the monastery where classes are held cannot accommodate such large numbers. “The government school in this village only teaches until Standard 4. If students want to study Standard 5, they have to study in schools in other villages. For students who don’t want to study in other villages [outside Pal Do], they can move to the Mon National School to study Standard 5 [once the school is completed]. I think that there will be more students after we build our new school,” remarked Mi Swe, a teacher with the school. Teachers have complained that it is very difficult to teach students in the community center because there are no walls to separate classes, making for a classroom environment that is much too loud to properly instruct children. Further, there is no space to store school equipment and teaching materials, and teachers have no option but to use the bathroom as storage. The new school is being built close to 2500 Sarsanar Monastery in Pal Do quarter, Pal Do village, Mudon Township, Mon State. As previously reported by HURFOM, this funding crisis is not limited to Pal Do, for townships across Mon State have had to rely on donations raised by the monastic community, and provided by Mon communities abroad, to ensure that Mon National School teachers are provided a salary, that school buildings are safe, and that students have the materials they need to study. These budgetary woes will likely increase given that the Mon State government has significantly reduced funding for Mon National affairs in the 2018-19 budget, a move that is expected to most heavily impact Mon education programs. According to Mawlamyine District’s Mon Education Department (2018), there are three Mon National High Schools, 16 Mon National Middle Schools, and 113 Mon National Primary Schools, with a total of 10,779 Mon students.